B Khan, M Ansari, D Shrestha, S Pradhan. A Case Report On Pulmonary Aspergilloma. The Internet Journal of Radiology. 2006 Volume 6 Number 1. Pulmonary aspergilloma is the most common form of aspergillous pulmonary invovelment, which has been found in preexisting cavities especially secondary to tuberculosis. Usual presentation is hemoptysis, with or without chronic cough, but may remain asymptomatic. In cases of massive hemoptysis, lobectomy may be required if the patients general condition is fit, as in our case. Intaracavitary mobile mass is variable, but an important sign. CT scan is the choice of examination in defining the fungus ball particularly in fibrotic and distorted lung fields. Presence of aspergilloma is the most common and recognized form of non-invasive aspergillous pulmonary involvement 1. The aspergilloma (fungus ball) consists of masses of fungal mycelia, inflammatory cells, fibrin, mucus and tissue debris, usually developing in a preformed lung cavity. Although other fungi may cause the formation of fungus ball (eg. zyomycetes and fusarium), aspergillous spp (Esp. a. fumigatus) are by far the most common etiologic agents 2. The true incidence of aspergilloma is not yet known. Aspergilloma have been found in preexisting cavities formed secondary to tuberculosis, sarcoidosis, bronchiectasis, bronchial cysts and bullae, ankylosing spondylitis, neoplasm or pulmonary infarction 3. Of these tuberculosis is the most frequently associated condition 4. A 40 years-old-male smoker with the history of active pulmonary tuberculosis, treated by ATT, presented in out patient department in Tribhuvan University, Teaching Hospital with the complaints of chest pain and cough for 6 months. He had hemoptysis, which was recurrent and quite large in amount, twice in a month. He had no history of fever, breathlessness, and anorexia. The general physical status of the patient was satisfactory. There was no tracheal shifting. There was increased resonance in the right supra and infraclavicular areas on percussion. On auscultation there was bronchial breath sounds in the same area with few crepitations. Patient was mildly anaemic. The clinical examination of the rest of the system revealed no abnormality. Biochemical tests showed the Hb level of 8 mg % rest of the parameters were within normal limits. Sputum smear examination by gram and Ziel Neelson staining for AFB were negative. Sputum culture for pyogenic bacteria showed no growth. Chest X-ray (Fig-1) showed a large thin walled cavity with a mobile intracavitary body in the right upper lobe .The right hilum was pulled up with few fibrotic bands adjascent to the lesion with tenting of the dome of the diaphragm. Rest of the lung fields was normal. Incidentally, deformity of the left shoulder girdle and upper left thoracic cage was seen. These findings were further verified on CT (Fig. 2, 3, 4), which in addition better defined the segmental involvement. 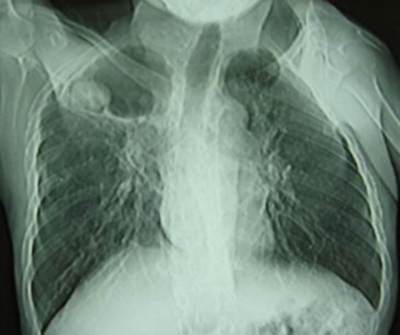 Figure 1: Plain radiograph of chest P/A view showing a cavity in the Rt. upper lobe containing an intracavitary body. 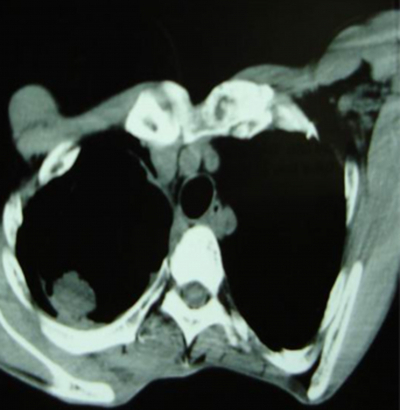 Figure 4: CT scan chest (mediastinal window) showing no significant contrast enhancement after administration of the I.V contrast. The patient subsequently underwent lobectomy (RUL) and the imaging findings were confirmed peroperatively. The specimen was sent for histopathological examination, which suggested it to be aspergilloma (sp. a. fumigatus). Hence the diagnosis of healed intrapulmonary tuberculosis with intracavitory aspergilloma was confirmed. Aspergilloma represents a saprophytic growth of aspergillous that colonizes in the preformed cavities (commonly pulmonary tuberculosis) 2, 5. They are usually located in the upper lobes of the lungs 6 and are mobile intracavitory masses as seen in our case. The true incidence of the aspergilloma is not known yet. In a study of 544 patients with pulmonary cavities, secondary to tuberculosis, 11% had radiological evidence of aspergilloma7, but no estimate is available for Nepal till date. Natural history of aspergilloma is variable. An aspergilloma may be asymptomatic 8. The most common presenting symptom is haemoptysis, which is reported to be seen in 50-80% of patients 7. Most patients will experience mild haemoptysis but massive and life threatening haemoptysis may occur particularly in patients with underlying PTB 9. In a study done with 9 patients 5 all had complaints of haemoptysis and 5 presented with cough. The characteristic radiographic picture of a pulmonary aspergilloma is of one or more round or ovoid intracavitary mass. A change of position of aspergilloma within the cavity with change in position of the patient is and interesting and a variable sign 7, 10. This sign was also seen in our case. However this sign is nonspecific because other entities like haematoma, neoplasm, abscesses, hydatid cyst and wegeners granulomatosis also demonstrates this feature 11, 12, 13. In our case, Rt. upper lobectomy was done since the patient was having recurrent massive hemoptysis, which is the definitive treatment for aspergilloma in such cases 15, 16. Other serological investigations to confirm the diagnosis of aspergilloma was not performed in this case as the patient was a better candidate for surgery than for the conservative management. 1. Goel Manoj K, Mussa Abdikarim Y, Banavaliker J N, et. al. An uncommon case of multiple pulmonary aspergillomas. Ind J Tub 1997; 44: 141-2. 2. Ayaman O. Soubani, Pranatharthi H. Chandrashekar. The clinical spectrum of Pulmonary Aspergillous. Chest 2002;121(6):1988-99. 3. Zizzo C, Castriota Scanderbeg A, Zarrelli N, et al. Pulmonary aspergillosis complicating ankylosing spondylitis. Radiol Med (Torino) 1996; 91: 817-8. 4. Kawamura S, Maosaki S, Tomono K, et al. Clinical evaluation of 61 patients with pulmonary aspergilloma. Intern Med 2000; 39:209-212. 5. Sakarya M E, Ozbay B, Yalkhinkaya I, et al. Aspergilloma in the lung cavities. East J of Med 1998; 3(1):7-9. 6. Tuncel E. Pulmonary air meniscus sign. Respiration 1984; 46:139-144. 7. British Tuberculosis and thoracic Association. Aspergilloma and residual tuberculous cavities; the results of resurvey. Tubercle 1970; 51: 227-245. 8. Glimp RA, Bayer AS. Pulmonary aspergilloma; diagnostic and therapeutic consideration. Intern Med 1983; 143:303-308. 9. Faulkner S L, Vemon R, Brown PP, et al. Hemoptysis and pulmonary aspergilloma operative versus nonoperative treatment. Anu Thorac Surg 1978; 25: 380-392. 10. Roberts C M, Citron K M, Strickland B. Intrathoracic aspergilloma: role of CT in diagnosis and treatment. Radiology 1987; 165:123-8. 11. Bandoh S, Fujita J, Fukunaga Y, et al. 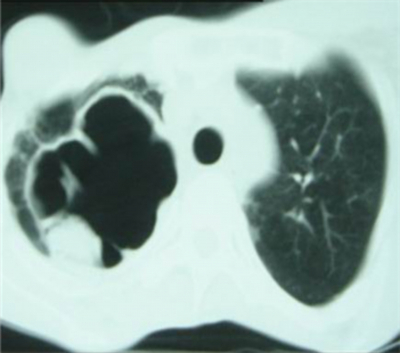 Cavitory lung cancer with an aspergilloma - like shadow. Lung Cancer 1999; 26:195-8. 12. Le Thi HD, Wechsler B, Chamuzeau JP, et al. 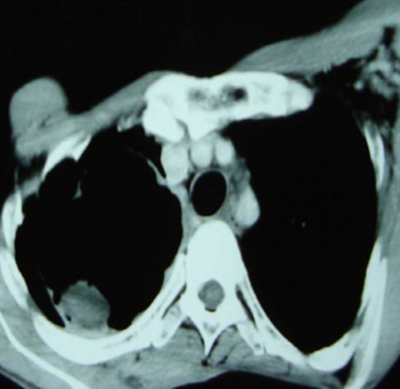 Pulmonary aspergilloma complicting Wegeners's granulomaatosis [Jeter]. Scand J Rheumatol 1995; 24: 260. 13. Knower Mark T, Kavanagh Peter, Chin Robert Jr. Intracavitory haematoma simulating Mycetoma formation. Journal of thoracic imaging 2002;17(1): 84-8. 14. Breuer R, Baigelman W and Pugthegn RD. Occult mycetoma. J Comput. Assist. Tomogr 1982; 6:166. 15. Andren SM, Bhattacharjee M, Keenan DJM, et al. Squamous cell carcinoma occurring in the wall of a chronic aspergilloma. Thorax 1991; 46: 542. 16. Butz RO, Zeetima JR and Leinmger RJ. Ten years experience with mycetoma in patients with pulmonary tuberculosis. Chest 1983; 87: 356.